Go to Team page to manage your team account. You can see the status and role of every teammate you have in Reply. To add a new team member click the red 'plus' button, enter the person’s name and email address and select their Role from a drop-down list (Admin or Regular). They will receive your invitation by email with a sign-up link. Being a team account admin, you can always edit the roles and email addresses of other team members. You can cancel your invitation if you change your mind or remove a user from your team using the drop-down list under the arrow on the right side. 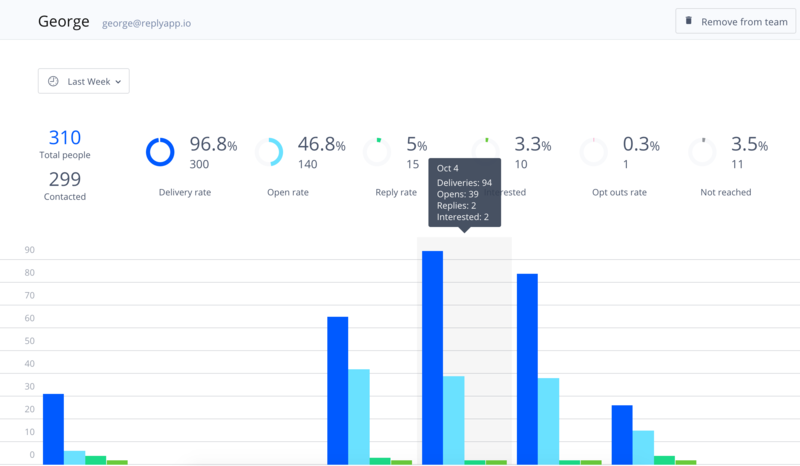 On this page, you can also find the metrics of the total number of Delivered emails, Open and Reply rates in all your teammates' accounts. If you click on your colleague's name, you'll be navigated to his/her profile with detailed reports. You can share email templates with your team (you cannot share people, campaigns, lists, and merge user accounts). Admin can switch over to the team member's account and work in it. Please note, that session in your teammate's account lasts 20 minutes, and if you don't save changes, the system will switch you back to your personal account and may also transfer some changes to your account (for example, create campaign you've been creating in your team member's account). It's also possible to see detailed analytics of each your team member on Reports page.